In central Oklahoma, some 30 families in the rural Bethel community — including 75 kids ranging from infants to high schoolers — received food, new clothing, and Christmas gifts in an act of love and support that is annually coordinated by the Bethel United Methodist Men. At the church on a very cold morning Dec. 17, Future Farmers of America students helped sort the food and loaded families’ vehicles when they arrived for pick-up. Others in the community near Shawnee also joined the UMMen and Bethel United Methodist Church in this effort. Over 3,000 non-perishable food items were donated for neighbors who are hungry. Several people gave cash to help buy provisions. To collect the toys and clothing for the children, high school senior Michaela Flatt reached out to various community groups. This was the eighth Christmas she has organized a toy drive. Among the groups that participated were Dreamcatchers Dance Studio, New Hope Baptist Church, and Bethel school’s Lower Elementary Gifted/Talented students (GT). Kristy Swafford and Regina Flatt, Michaela’s mom, sponsor the GT students. 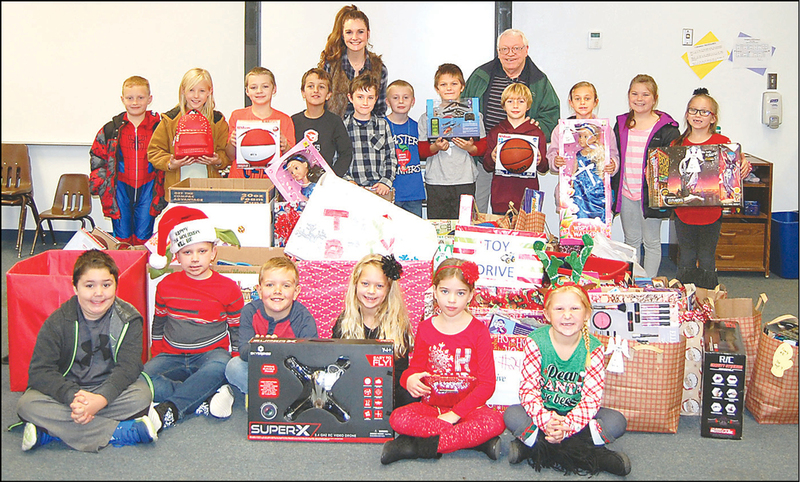 These Bethel elementary students collected and wrapped toys, helping high school senior Michaela Flatt and UMMen leader Jim Jenkins, back row, make Christmas merry for other kids.